Companies functioning in the global hearing protection equipment market are anticipated to find new market opportunities in emerging countries in the near future, identifies Transparency Market Research (TMR). Bullard, Uvex Safety Group, Honeywell International Inc., 3M Co, Msa Safety Inc, Kimberly-Clark, Grainger, Inc, Avon Rubber Plc., E I Du Pont De Nemours and Co., and Ansell Limited are among the leading companies profiled in TMR’s report. A majority these market players are actively focusing on development of more efficient products in order to increase their customer base. 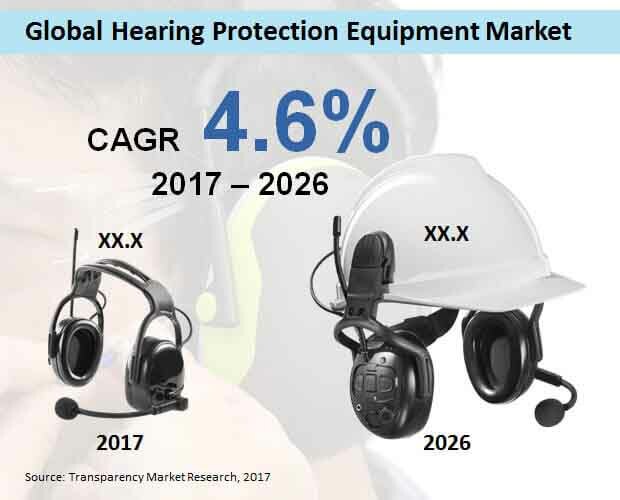 As per the latest report published by Transparency Market Research (TMR), the global market for hearing protection equipment is set to exhibit a CAGR of 4.6% from 2017 to 2026 and surpass a valuation of US$ 5,000 Mn. Growing concerns overs worker safety is expected to influence the global market for hearing protection equipment during the assessment period. At the same time, increasing efforts to standardise working conditions in emerging countries is anticipated to further drive the demand for hearing protection equipment in the forthcoming years. Regulatory bodies in these countries are enforcing new laws that ensure a better safety standards in manufacturing sites in the country. Moreover, rising awareness of workplace safety among workers along with introduction of advance hearing safety gears and devices is have a positive impact on the market. Hearing protection equipment find widespread application in various industries including oil & gas, construction and manufacturing among others. Also, rapid growth of industries in countries such as Brazil, China and India is creating market opportunities for various typed if safety gears, including hearing protection equipment. Further, local authorities in developing countries are introducing new policies that are directed towards improving the working conditions in manufacturing facilities in the country. Workers in third-world countries face a greater risk of damaging their sensory organs at work owing to poor of safety standards. Nonetheless, governments in many of the third-world countries are making policy reforms that are aimed at improving the labour safety law. Factors as such are expected to influence the global sales of hearing protection equipment during the review period. Among regions, the market for hearing protection equipment in North America is anticipated to remain highly attractive throughout the projection period. In terms of revenue, the region is expected to retain its top position over 2026. Between 2017 and 2026, North America’s market is set to witness a CAGR of 4%. This primarily owing to presence of a refined worker safety regulatory lanscape in the region. On the basis of product type, the single use earplugs segment is likely to hold the top spot in 2018 and beyond. This segment currently command for nearly one-third revenue share of market and is anticipated to cross a market valuation of 1,700 Mn by 2026, expanding a modest CAGR. Based on application, the manufacturing segment is likely to represent for a considerable market share in terms of revenue. The segment commanded for more than 21% revenue share of the market and is expected to witness a CAGR of 2.7% during the forecast period.